We are happy you chose Inspire Planner. Our aim is to simplify project management in the easiest and most intuitive way possible. Let's get started! Enter "Inspire" in the search box. Look for Inspire Planner under All Apps and click on it. Click on Inspire Planner from the dropdown menu on the top right-hand corner of the page. 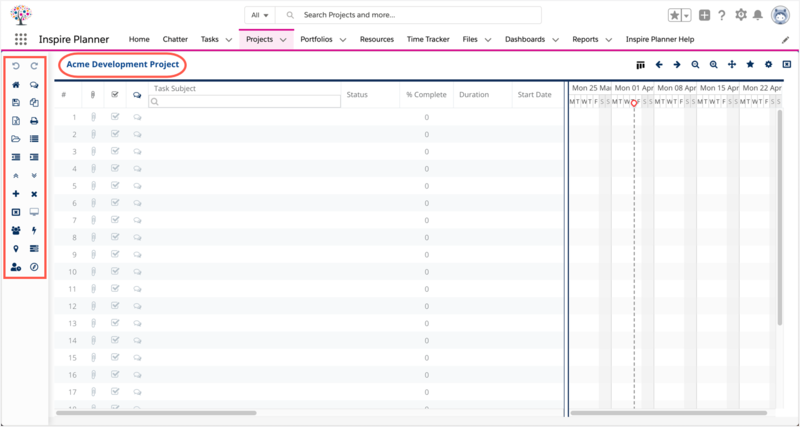 Once you are in Inspire Planner, navigate to the Projects tab. Here is where you create and view your projects. By default, the page will display projects you've recently viewed. 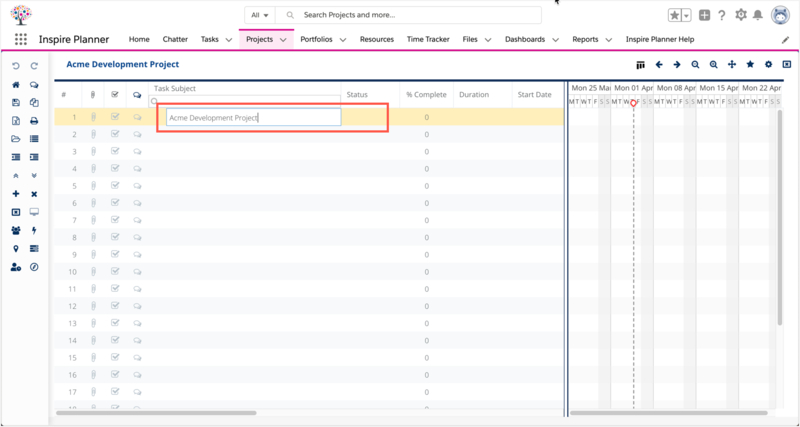 You can choose which projects to view using the dropdown menu on top of the list. If you want to view all projects, select All from the list. To create a new project, click on New. Fill in your project details such as the Project Name, Project Status, (and optionally) the project Description, and Account. Now you are ready to create your project plan! 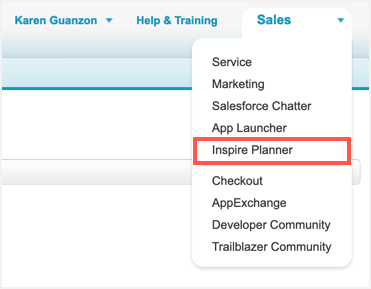 Familiarize yourself with the Inspire Planner user interface. You will find your Project Name in the top left hand corner. On the left is a Project Toolbar containing icons that perform different actions. Unsure of what the icons do? See Navigating the Inspire Planner Interface for more information. Now that you’re familiar with the Toolbar icons, double-click on the first row to add your first milestone or task. Typically, the first row should be the overall project since milestones and tasks roll up to the parent which is the overall project. Tasks can be organized according to phases/milestones, parent and child tasks. Child tasks roll up to its parent. This means that the duration you see on a parent is the total duration of all its children. The same goes for Start and Finish Dates, Planned and Actual Effort, and Budgeted and Actual Cost. This allows you to then see the overall status of the parent based on the child tasks. List your milestones and tasks first. Then use the indent icon to indicate child tasks. To do so, follow the steps below. Click on a the task you wish to indent. To indent multiple tasks, hold the Ctrl key as you click on each task. On the Toolbar, click the Indent Selected Task icon. To remove the indent, click the Outdent Selected Task icon. Whenever you make a change to the project plan, you will see red marks beside your changes. These indicate that the changes you have made have not yet been saved. Remember to always click the Save Project Plan icon on the Toolbar. 4. Right clicking on a row will display a context menu where you also have the option of creating tasks. Please note: Once you indent tasks to indicate child tasks, you are no longer able to modify the Duration, Start or Finish dates, Planned Effort, Budgeted Cost, Status and % Complete of the parent/ principal task, since they become a roll-up of the subtasks. Finish to Start (FS) - task begins only after the previous task is finished. Start to Start (SS) - two or more tasks start at the same time but could have different finish dates. Finish to Finish (FF) - two or more tasks end at the same time but could have different start dates. Start to Finish (SF) - indicates that previous task cannot finish until the succeeding task has started. For more information, see Creating Relationships with Predecessors. Your next step is to specify the Start Date and Duration of your tasks. The Start Date is when the task is set or expected to begin and duration is the length of time for the task to finish. By default, when you add a task to your project plan, it uses the current date as the start date. You can select a different date by double clicking on the date under the Start Date column and pick a date from the calendar. You'll notice that if you change your start date and predecessors have already been defined, the succeeding tasks automatically adjust. Next, specify the Duration. The default unit for measuring duration is in Days and when you create a task, the duration is set to 1 day. You can adjust the duration by double clicking on it. Use the arrows to increase/decrease duration. Duration can also be defined in hours (h) , weeks (w) or months (mo). Simply enter the number followed by the unit. For example, if the duration for the task is 4 hours, you would enter it as 4h. When increasing/decreasing duration, it will then adjust it in hour units. As you adjust the duration of a task, the Finish Date adjusts accordingly. If the duration is set in hour units, the Finish Date automatically adjusts based on the defined working startand finish times in Settings. You can access settings by clicking on the Gear Icon at the top right corner. The finish date will automatically adjust to the following day when the number of hours specified in Duration exceeds the working time specified in settings. If the duration of a task spans a weekend, the Finish Date will automatically adjust to the next earliest business day unless you specify in settings that weekends are working days. When working with subtasks, the Duration of the parent or principle task accumulates the combined Duration, Start and Finish Dates of the subtasks. Tasks can then be assigned to resources who will be working on them. Tasks can be assigned to fellow users or to contacts. A single task can be assigned to one or more resources. 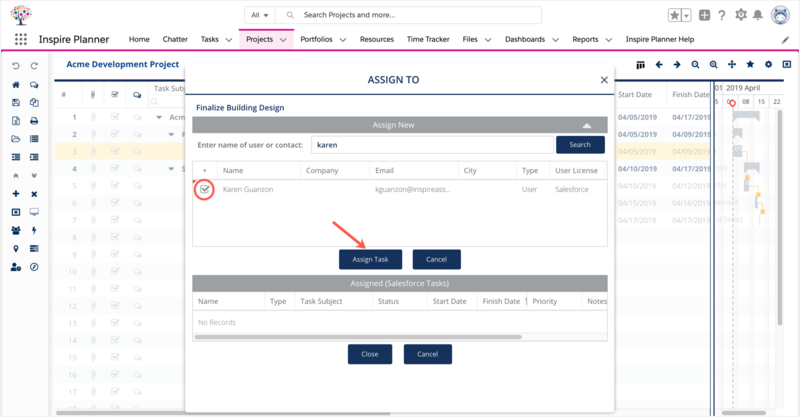 To assign a task, double click on the row under the Assigned To column and click on the Edit icon. An assignment box will open. Enter the name of the user or contact you wish to assign the task to and click on Search. A list of users and contacts that match the name you entered will display as a result. Select the user(s) or contact(s) and click on Assign Task. The user/contact's name will appear in the "Assigned (Salesforce Tasks)" box below. If you would like to assign the same task to more resources, you can enter another name in the search box to look for another user or contact. Once you've added all of the resources for the task, click on Close. If the task is assigned to multiple resources, you'll see each assigned resource's name separated by a comma. Review your overall project and Gantt chart, and you are ready begin! Make sure to update the status of tasks and percentage complete in order to maintain an accurate view of the project. Ensure that the appropriate users have been given editing/viewing privileges and off you go! Your Gantt Chart should look similar to what you see below. Never worked with a Gantt Chart before? Check out Understanding Your Gantt Chart under the Inspire Help tab. For help with other questions, check out our Inspire Help tab in the top menu bar for more How to Guides and Community Q&A. If you still didn’t find what you were looking for, log a Help Ticket and someone from our Inspire Support Team will get back to you. Happy project planning from the Inspire Planner Team!